Of course it should happen that on April 1st, the coldest most miserable day this spring, I discover that Baracka has been laying eggs in a remote corner under the front porch. I’d looked in there a few days ago when Mike suggested they might be checking it out as a laying spot, but it was too dark and cornery to see anything. It was pouring rain and sleet and snow all morning so I didn’t let the birds out until 3pm today. I also kinda hoped it would encourage someone to lay an egg. After letting them out, petting Baracka and pushing on Rocky’s back (she literally asked for it), I headed back inside and noticed Baracka was not with the other two out in the yard. I became suspicious and headed back outside. Sure enough she’s under the porch. And she won’t budge. Scott gets her out and we reach into the dark awkward corner to find a total of 3 eggs on really old dirt, random scrap metal, and cat poop. Eew. We block the access to the porch, put the eggs in the nest box, put Baracka in the coop. She checks out the eggs, but uses the open nest box door as an escape route. After I put her back in the coop I discover a fourth egg on the soft ground outside the nest box. It is warm. I’m thinking I pushed it out of her as I caught her escaping. She is not interested in the nest box and is frantic, so we let her outside. What can we do? Rocky and Greta still squat for us (aka ‘assume the position’) so I’m thinking that means they have yet to lay eggs since Baracka stopped doing this 4-5 days ago, just about when she would have laid that first egg. So now we have an egg-laying hen, but how do we get her to lay in the nest box?! This entry was posted in baby chickens, eggs, nest boxes. Bookmark the permalink. 6 Responses to The First Egg! Put a fake egg of any kind – we used a hot pink easter egg, in the box where you want them to lay. It mostly worked for us. One of the girls still leaves them right outside the box. Oh well. Maybe she has control issues? Good luck. I did have fake eggs in there (http://sustainablescientist.blogspot.com/2009/02/winter-life-at-our-small-urban.html), but I think the nest box is just not somewhere they’ve happened by. I followed suggestions in various manuals for dimensions and placement (http://sustainablescientist.blogspot.com/2009/01/nest-boxes-awaiting-eggs.html – I since put two 2x4s as a platform in front of the boxes) but apparently I didn’t get it right. I grant our chickens that there are a multitude of fabulous places they can lay eggs in the yard, but still…I’ve left a couple of eggs in there for her should she decide to investigate further. 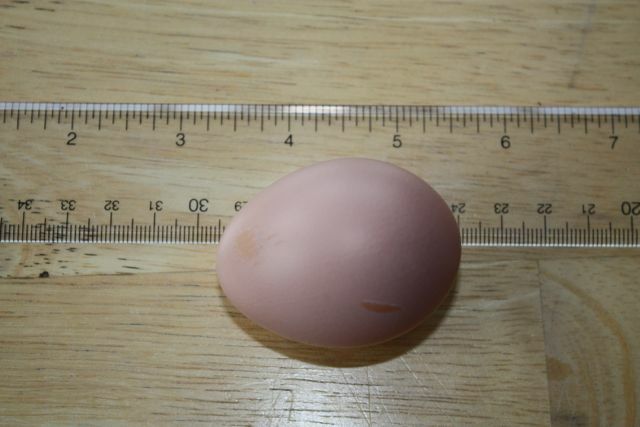 Some people say lock up the chickens with fake eggs in the nest boxes until they get it…?? hmm, will this turn Marlow into an eggman? ref. The Beattles, er, actually The Animals. maybe the feng shui is off in their pen?